The mini micro and the zoom cruzer are two popular 3 wheel scooters for young children. The main obvious difference between the two is the mini micro is a lot more expensive. So apart from the price what are the main differences between the two scooters? Is it worth spending the extra money on the mini micro and what do you get for your money. Read on to find out. No but bar can be taken out of the stem for easy transportation. These scooters have high quality parts, are extremely well designed and built to last. Each main part is can be repaired or replaced meaning that the scooter’s lifetime is indefinite. It doesn't need to end up in the landfill. It can be passed onto brothers or sisters. And when you’ve finished with it, it can be sold and you can recoup some of the initial outlay for the scooter. The scooter has been extremely well thought out and designed for young children. For example, it’s extremely lightweight. At just 1.5kg, it’s super easy for little ones to control. They can easily pick it up to move up and down kerbs and steps. When they start scooting they can pick it up and turn it round to change direction. It is also easy for parents to carry when kids have needed. The low weight really is and advantage. The handlebar can be easily adjusted to any height between 49 and 69cm making it the perfect height for each child. As the handlebar height goes very low, it means the youngest of children will be happy using it but also will be good for children as they approach age 5 too. It's easy to adjust so can easily be adjusted for use between 2 children. The handlebar has an anodised stem which protects it from corrosion. The handlebar isn't foldable but you can remove it from it’s base for easy storage and transportation. The mini micro deluxe features an anti slip reinforced footplate for extra stability. The mini micro is obviously a pricey scooter but you only have to read the 5 star reviews to know you are buying a scooter that isn't going to break in a year of use. The other thing to consider is that the mini micro has a good second hand resale value. So once you’ve finished with the scooter you can sell it on and recoup some of the money. It’s also a scooter that can easily be passed onto younger brothers and sisters, so you may need only to buy one 3 wheel scooter for all your children. Verdict - the mini micro is so will designed. Thought and care has gone into perfecting every piece which does make it unrivalled in terms of quality and design. The adjustable handlebar makes it a top scooter for every child in the 2 to 5 age group. It will grow and be perfect for your child at every stage. If you’re looking for a scooter on a budget for a young child, the zoom cruzer is definitely one to consider. It’s one of the cheapest 3 wheel scooters on the market with some excellent features. The handlebar has 3 settings at 55cm, 66cm and 75cm. Whereas you can't adjust to any height in it's range like you can with the mini micro, there should be a height setting to suit most children between the ages of 3 and 5. If you’re going to buy for a 2 year old, it will probably be worth looking for a scooter with a lower setting like the mini micro. ​The weight for this scooter is just under 3kg. This isn't heavy by any means but if you are buying for a younger, smaller child a lighter scooter will be easier for them to control (pick up to go up and down kerbs etc). However the zoom cruzer does have an age recommendation of between 3 and 5 and most kids between those ages will be fine with the weight. The scooter has 120mm front wheels and an extra wide 100mm by 45mm rear wheel which offers extra stability and support to young riders. The zoom cruzer features a strong re-inforced extra grip footplate for extra safety and stability. Verdict - the zoom cruzer doesn't match up to the quality and features of the mini micro. However, you are getting a scooter that will be fine for many 3 to 5 year olds. If this scooter is going to be used for the school run everyday, you may be worth looking at spending a bit more. But if it’s one for occasional use in the park, it’s a good scooter to go for which won't break the bank. Final Decision - which one to choose? 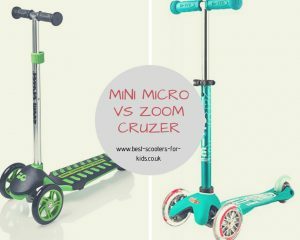 Whether you choose the zoom cruzer or mini micro will very much depend on the age and needs of your child, how much you will use the scooter and the budget you have. If you are still unsure, check out some reviews of the mini micro and some reviews of the zoom cruzer and check out the video footage of the mini micro below.